Gboma dessi is a recipe from one the smallest countries in africa. It is really a sauce. It is also called “sauce feuille” in reference to the spinach leaves (feuilles in French). Once prepared, the sauce can be served with meat, shrimp, crab or smoked fish. 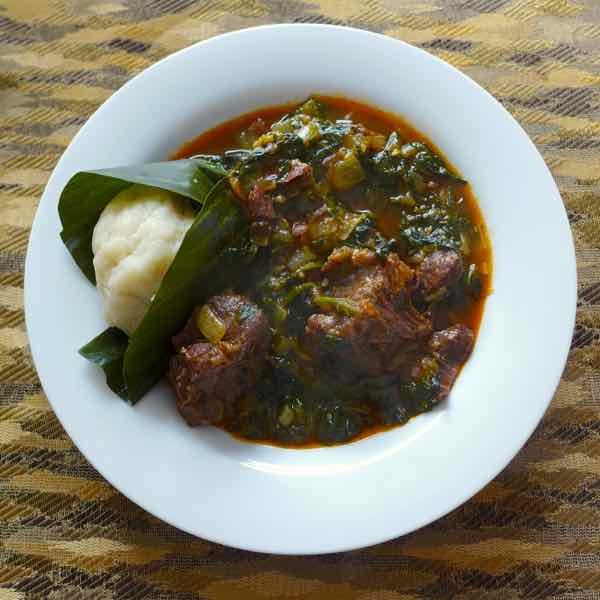 While preparing Gboma Dessi, you can choose any type of beef, or meat. The gboma dessi can be used with various sides such as white rice. Ablo and akoumé, which are quite similar, are kind of dumplings that serve as staples in West African cuisine. They may seem rather bland or tasteless at first, but they are used primarily to absorb the flavors of saucy dishes like this one. Remove the meat from the pan, drain and place in a bowl. Keep the broth in the pot. Season the meat with gbotemi. While the meat is cooking, wash the spinach leaves. Boil in salted boiling water for 15 minutes, then cut into thin slices. Add the tomato puree. Stir regularly for at least 15 minutes. Season with pepper, 1 cube of bouillon, hot peppers. In a saucepan, pour 2 cups of water. Add maize flour and mix with a wooden spoon. Bring to a boil, add the wheat flour and stir vigorously. Dilute starch potato in 1 cup of water. Pour into pan. Stir vigorously for 2-3 minutes. Cover the pot and cook over medium heat for 5 minutes. Once the dough ready, it’s time to shape. To do this, take a ball of dumpling and place it in an empty bowl. Rotate the bowl a few times to obtain a uniform ball.